The outstanding clinical physician - roentgenologist Yury Nikolaevich Sokolov was born in Moscow in 1905. Yury Nikolayevich’s father was a lawyer, his mother was one of the first X-ray technicians in Moscow. After graduating in 1930, 1 Moscow Medical Institute, he worked as a doctor for 2 years and in 1933 he entered the graduate school of the Moscow Institute of Roentgenology and Radiology. In 1936, Yu.N.Sokolov defended his PhD thesis, in which the influence of X-rays on Arthus phenomenon and allergic reactions. In the same years, Yu.N.Sokolov began his pedagogical activity, working part-time assistant of the Department of Radiology, CIU doctors. In June 1941 he was drafted into the army. On the Bryansk, Voronezh fronts, he headed the X-ray department as part of hospitals, and in 1943 he was appointed chief radiologist of the 1st Ukrainian Front. Being in the army, not stopped scientific work, publishing articles, making reports and participating in the compilation of collections of scientific papers frontline radiologists. He organized courses on the specialization of frontline radiologists. Yu.N.Sokolov headed Editorial Board of the collection of scientific papers of the Voronezh Front. After demobilization, Yu.N.Sokolov returns to the IRIRRI, where he works as a senior researcher, and then Deputy Director for Science Institute. During this period, Yuriy Nikolayevich conducts research in the field of X-ray diagnostics of diseases in gastroenterology. During these years, he and A.I. Ruderman were released. monograph "Radiodiagnosis of gastrointestinal cancer". The second direction in scientific activity Professor Yu.N.Sokolov became a radiopulmonology. A number of articles were devoted to research on the study of chronic emphysema and pulmonary insufficiency. During the work, the phenomenon of pulmonary transparency was identified and proved. tissue inhale and exhale. "Sokolov's test" has not lost its relevance in our days. In 1951, a doctoral dissertation was defended on this topic. In 1952, Professor Sokolov was elected to the post of Head of the Department of Radiology 1 Moscow Medical Institute. IM Sechenov, and in 1953 became the head of the Department of Radiology No. 2 of the Central Institute improvement of doctors. This department was located at the base of the 50th Clinical Hospital. Department of Radiology №1 in CIU was headed by Professor S.А.Reinberg. After his death in 1966, the 1st and 2nd departments were united, and the new department headed by Yuri Nikolayevich. Joint Department of Radiology, Professor Sokolov headed 11 years, until 1977. From 1977, at his personal request, he moves to the post of consultant, which he occupies until his death in 1984. The Department of Radiology of the Central Medical University of Doctors, during the years when the department was headed by Yu.N. Sokolov, was undoubtedly the leading department in radiology. It was during these years that Yu.N.Sokol was actively working in the field of x-ray diagnostics of diseases. digestive tract and lung. Under his leadership the master’s theses of N.U.Schniger were completed - X-ray diagnosis of peptic ulcer, P.V.Vlasov - X-ray diagnosis of excess gastric mucosa, R.S.Rubinov - X-ray examination of the colon. Such famous specialists as L.S. Rozenshtrauh (future Head of Department), V.Ya. Fridkin, M.G.Winer, L.A.Gurevich, Sh.Sh.Shatemor, V.B.Antonovich. The author of more than 150 scientific publications, Yuri Nikolayevich Sokolov left a noticeable trace in x-ray science. Terminology in radiology and radiology, methods for objective registration of pulmonary emphysema, issues of fluorography lungs, respiratory research techniques, diagnosis of bronchopneumonia - all these issues have been deeply studied in the department. The priority scientific research at the department, of course, were studies of diseases of the gastrointestinal tract. From the monographic works of Yu.N.Sokolov, it should be noted “Radiodiagnosis of gastric tract cancer”, 1947 (in et al. with A.I. Ruderman), monograph "Relief of the gastric mucosa in health and disease," 1968 (with P.V.Vlasovym), the manual "X-ray diagnosis of tumors of the digestive tract" (together with VB Antonovich). Everything these works have not lost practical and scientific significance at the present time. Under the direction of Yu.N.Sokolov 7 doctoral and 40 master's theses have been prepared and defended. In addition to the scientific activities of Yu.N.Sokolov was an active participant in public life, the organizer of the educational activities for doctors. In the second half of the 50s and in the 60s, radiographic Moscow was popular interdepartmental clinical and radiological conferences. They were organized by S.A. Reinberg, but in them Professor Yu.N.Sokolov and members of his department took an active part. Not only rare and difficult cases of X-ray diagnostics, but also young specialists were trained on typical clinical situations. Among the leading radiologists often had serious discussions. In this case, the focus of the analysis was on clinical, methodical aspects and to a lesser extent, on scientific. For radiologists it was a real school. clinical and radiological thinking, which dominates among radiation diagnosticians at the present time. In a few in a different way - lecturing for all clinical residents of the first year - these are common to all conference departments, currently resumed at the initiative of Corresponding Member of the Russian Academy of Sciences, Professor A.Yu. Vasiliev. For 33 years, Yu.N.Sokolov worked in the editorial office of the journal "Herald of Radiology and Radiology", of which 27 years - in positions of the chief editor of the magazine. He was a member of the Board of the All-Union, All-Russian and Moscow Society radiologists and radiologists. 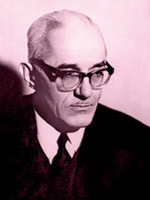 Over the years, Yuriy Nikolayevich was the chief radiologist of the USSR Ministry of Public Health and the IVV Main Administration under the USSR Ministry of Public Health. Yu.N.Sokolov was a wonderful teacher, possessed an excellent lecturing skills. His lectures differed clear methodical skill, elegance, exquisite speech. Yuriy Nikolayevich was a typical representative of the old Moscow intelligentsia. He spoke good Russian, his manner, his appearance - all this attracted Attention. Yuriy Nikolayevich found the beginning of big changes in the new era of radiology. Computed tomography for brain research made a big impression on him. According to the testimony of Sh.Sh. Shatemora (student Professor Sokolov), Yuriy Nikolayevich was struck by the possibility of differentiation of the gray and white matter of the brain. "It fiction "exclaimed Yu.N.Sokolov." At the present stage of development of radiation diagnosis the creation and evolution multispiral computed tomography, high-field magnetic resonance imaging, modern ultrasound and positron emission diagnostics, allow you to get closer to the diagnosis of pathological conditions on the cellular level. But, undoubtedly, the development of classical radiodiagnosis, which in many respects has not lost its relevance, has been ensured great contribution of past generations of clinical radiologists. The pleiad of their most prominent representatives includes Yuri Nikolaevich Sokolov .